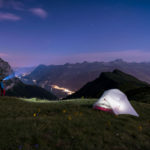 This is a very powerful function of flash photography and when used correctly and in the right situations can produce you some spectacular and unique images, but may photographers don’t fully understand its function and how it works, I hope the following will help shed some light on this and enable you to use it to your advantage. Now your camera’s shutter consists of two curtains or actions is the easiest way to explain it. These are called the 1st or front curtain and the 2nd or rear curtain. 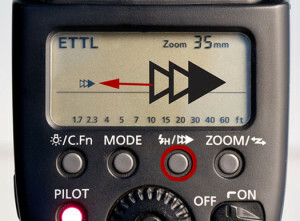 When taking a picture, you typically press the shutter release button, then what happens is that the shutter opens to expose the sensor to light and thus record your image, the shutter then closes at the end of the exposure, your picture has now been recorded and the camera is ready for the next shot. 2nd curtain sync or rear sync is a flash photography technique that is usually used when shooting in low light conditions, with a slow shutter speed and obviously using flash, this can be both a built in flash or an external speedlight. When you’re shooting with one of these flashes, the flash can fire at two different positions of the action of the shutter, either it will fire right after the shutter opens or it will fire just before the shutter starts to close. 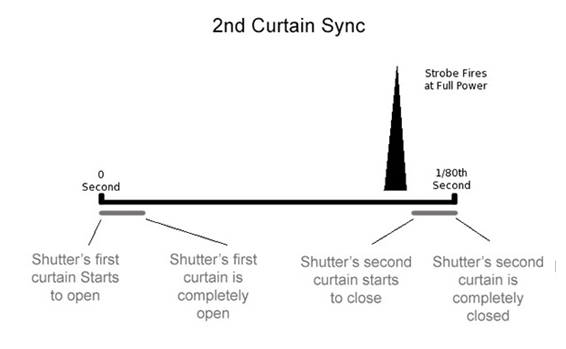 If the flash fires right after the shutter opens, this is called 1st curtain sync (or front sync). 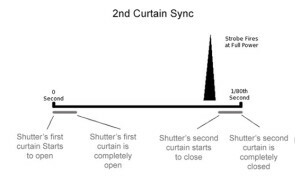 If the flash fires right before the shutter starts to close to end the exposure, this is called 2nd curtain sync (or rear sync). Now many of you at this point may be saying ok but now how do I change between the flash sync modes and when would I use 2nd curtain sync as opposed to 1st curtain and how would this influence the result of my image. You will find these answers below. How to switch your camera/flash between flash sync modes. 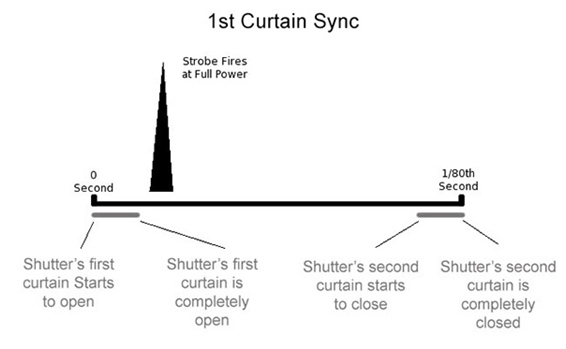 Most cameras are set to 1st curtain sync by default. You can of course change your flash sync mode from the camera’s menu and custom settings or on the speedlight itself depending on make and model. Now I will briefly describe how to do this on the two major camera brands that I am familiar with, Canon and Nikon. 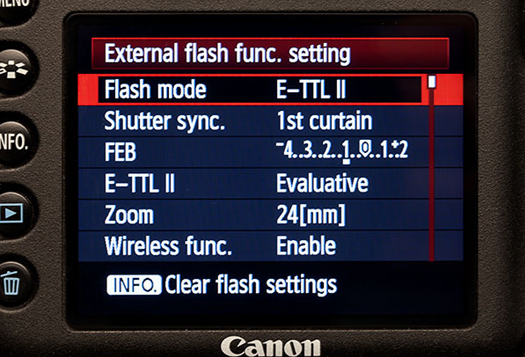 Now most canon cameras will allow you to set curtain sync mode either from the camera settings menu or from the back of the speedlight itself. With Nikon, you can only set sync modes from your camera’s settings menu. To switch between sync modes from the camera menu using a built in flash, go to the custom functions menu, from there go to the image/flash exp/disp option, now scroll through until you get to the shutter curtain sync option here you will see the two options of 1st curtain sync and 2nd curtain sync. To set an external speedlight from the camera menu, go to the external speedlight control option when you enter this option you will see a number of settings you can make and one of them will be the shutter sync. To set directly on the speedlight itself press the button on the flash that looks like a fast forward button with 3 arrows in a row, press this a number of times until the corresponding picture shows in the flash LCD display. Now the functionality will be slightly different from model to model but there are 2 main positions of the activation button. The first being on the front of the camera on the flash housing there is a button with a lightening bolt on it, the second option is the button with lightening bolt is on top of the command dial on the top left of the camera, press and hold this while looking at the top LCD Panel on the camera, you will see a rectangle with a lightening bolt on the side, now turn the rear mode wheel to scroll through the available options. So now when would you want to set your camera to 2nd curtain sync and what would the difference be in the result of the image? 2nd curtain sync is useful when shooting flash with slow shutter speeds. 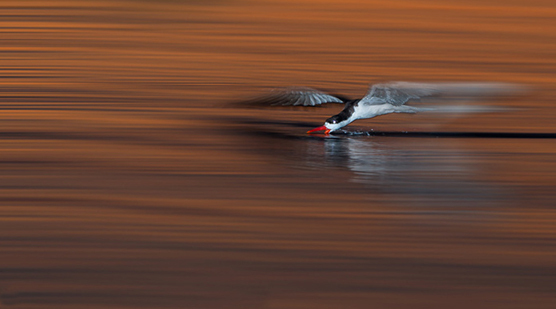 Imagine shooting a subject that is moving rapidly. 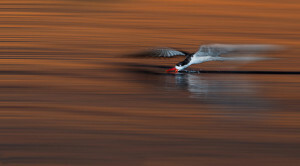 When the shutter opens any motion of the subject will be recorded as a blur, now just before the shutter closes the flash fires freezing the motion at a point and then the shutter immediately closes completely. In the final image the result would show the moving subject with blurred trails following the subject showing its movement and direction of movement but still maintaining sharpness having been frozen at the end of the exposure by the firing of the flash. Now lets use the same scenario but with 1st curtain sync. Imagine the same rapidly moving subject but what happens now is this. The shutter opens and immediately the flash fires freezing the motion of your subject at that point, but now because you are using a slow shutter speed the camera continues to record the motion of the subject as blurry after the flash has fired, then the shutter closes ending the exposure. The result in the image is as with the 2nd curtain sync, the subject is sharp and frozen at a point but this time the blur is in front of the subject creating a confusing image as if the subject was moving backwards, this may be interesting to you and you may even like the result in this case that’s great. 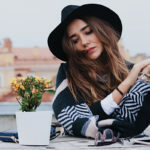 But logically the result of the image with 2nd curtain sync makes for a more realistic interesting image showing motion in the correct direction of movement, making the image more pleasing to the eye. 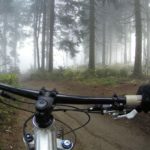 So to sum this all up, what do you do to get your subject’s blurred trails of motion behind them? 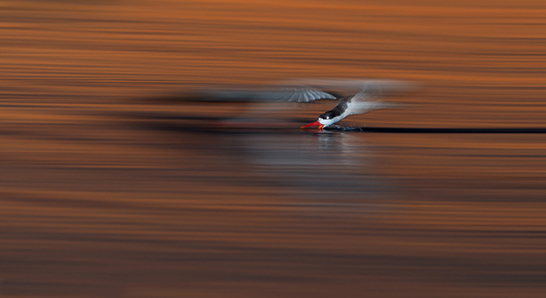 You set your flash or camera to fire in 2nd curtain sync mode using a slow shutter speed. 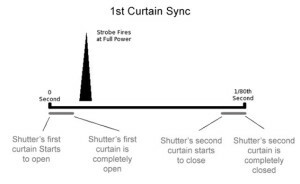 When you set your camera to 2nd curtain sync, the shutter opens and all the movement in the scene will be recorded as a blur in the direction of the movement. As the exposure comes to an end, and just before the shutter closes the flash will fire, the shutter will close ending the exposure. In the final image, you would have recorded all the motion blur trails, and then at the end of your exposure the flash fired freezing your subject at a point, resulting in a motion blur behind the subject instead of in front of it. Well I hope this longwinded post on 2nd curtain sync makes sense to you all and if you have any questions please feel free to contact me. 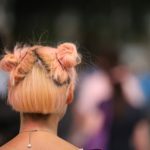 The post Second / Rear Curtain Sync in Flash Photography appeared first on ODP Magazine.